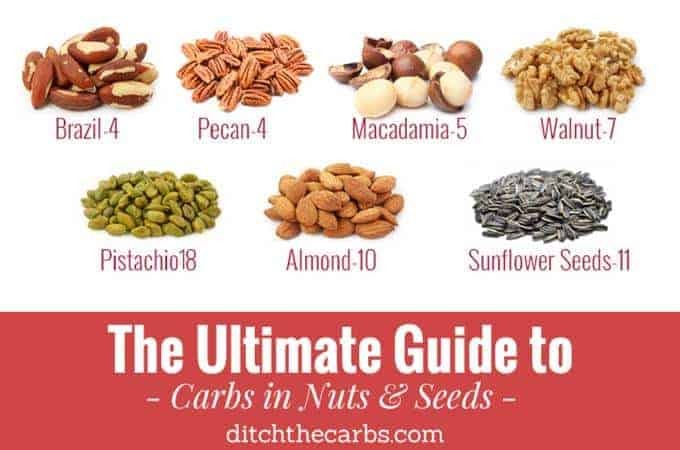 The Ultimate Guide To Carbs In Nuts And Seeds will help clear up any confusion you may have with which nuts and seeds to eat and which to avoid. By knowing the carb values, you immediately can make better, more informed, choices. Values are net g carbs per 100g. Some are really surprising. Take a look. When you first start living low carb, I bet you were excited to learn we can snack on nuts and seeds again. We no longer count calories and we no longer fear high fat foods, in fact increasing our healthy fats are encouraged (read here why that is). But many people slip up by overindulging on nuts and then realise their weight loss has stopped and wonder why. They never make the connection between nuts and the slow creep of carbs back into their diet. Why is that? VOLUME – Nuts are easy, portable and so easy to overdo. They can be oily and salty which is designed to hit our “bliss point”. This encourages the packet to disappear before our very eyes. HIGH CARBS – Many don’t realise how high in carbs some nuts and seeds can be. I can hear the groans already as I tell you to avoid cashews, chestnuts and pistachios. Snacking on nuts is so much better than snacking on high-carb junk food, and ground nuts such as almond flour is brilliant for low-carb baking. But make no mistake, the volume you may be consuming and the high carb contents of some nuts, can be the number one saboteur of weight loss. So let’s take a closer look at the most common nuts and seeds with their carb values. All nutrition values stated are net carbs (total – fibre = net) and obtained from USDA values from cronometer.com Values may vary slightly depending on reference used. Brazil nuts also contain vitamin B1, E, coper, magnesium, selenium, zinc and iron. Brazil nuts seem to be harder to overindulge with because most people tend to grab just a few to snack on. Brazil nuts can be lovely chopped up in a grain-free granola. Don’t cook them, but simply add them chopped once the granola has been cooked and cooled. They add a lovely nutty flavour and texture to the recipe. Brazil nuts are incredibly if you dip them dark chocolate for a little occasional treat. 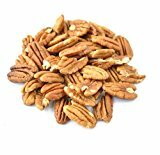 Pecans also contain vitamin B1, copper, magnesium, manganese, phosphorus and zinc. Pecans are amazing in sweet low-carb recipes, but baking with pecans soon adds up. Cheesecake bases may require a cup or two of pecans, and pecan pies will require even more for the filling and for decoration. With everything low-carb, it’s all about awareness, then the choice is yours. So just be aware of how many pecans go into a recipe, and enjoy a small slice. Pumpkin seeds also contain vitamin A, iron, magnesium and phosphorus. Pumpkin seeds can be a great little snack if you nibble on them one by one. Some great recipe to use pumpkin seeds are grain-free granola bars or chocolate grain-free granola. Some new low-carb flours are being introduced into the market, and one of them is pumpkin seed flour. If you can’t get hold of this near you, you can easily make your own by grinding raw pumpkin seeds in your food processor or coffee grinder. Macadamias also contain vitamin B1, B2, B3, B5, B6, copper, iron, magnesium and manganese. Macadamia nuts are an incredibly popular low carb and keto snack because they contain 75% fat. Macadamia oil is highly regarded due to it’s mild nutty flavour, and higher omega 3/6 ratio. Macadamia oil can be used in homemade mayonnaise (watch the video here), on salads and in dressings. Macadamia nuts are a great snack to carry around as the high fat content will keep you fuller for longer. Walnuts also contain vitamin B1, folate, copper, magnesium, manganese, phosphorus and zinc. Walnuts are beautiful to decorate chocolate fat bombs, they are my secret ingredient in sugar-free nutella and amazing when dipped in dark chocolate for a little occasional treat. Walnuts add a creamy texture similar to hazelnuts, but without all that fiddly roasting, then removing the shells. No-one has time for that. Walnuts are also amazing in these sugar-free walnut and brandy truffles. If you haven’t tried them yet, go ahead. Warning, I like them boozy. Peanuts also contain vitamin B1, B3, B5, B6, E, folate, copper, magnesium, manganese and zinc. Peanuts are one of the most controversial nuts here, because they are actually legumes. Many people avoid legumes because of the anti-nutrients, namely lectin and phytic acid. What do these toxins do? They are proteins which are said to bind to cell membranes. They can damage the lining of the intestine which may cause discomfort and bloating. Some studies however, show that lectins are found in many common every day foods so are not restricted to legumes and beans. So enjoy them if you can tolerate them, and they are within your carb allowance. Hazelnuts also contain vitamin B1, B6, E, copper, magnesium, manganese and zinc. Hazelnuts are commonly found in this well known chocolate spread, but did you know there are generally only 5 hazelnuts in an entire jar? And did know that one mother took them to court to repute their health claims, and won! To this day, that slogan had to be removed from the packaging. What’s worse, is that there is more sugar in the chocolate hazelnut spread than a chocolate bar. So think twice before you spread candy on your kids toast. Learn to make my sugar-free version and read the post why I use walnuts instead of hazelnuts (genius). Pinenuts also contain vitamin B1, B3, E, K, copper, magnesium, phosphorus and zinc. Pine nuts are commonly found in pesto, and leave a lovely creamy texture. But unfortunately, they are expensive to harvest and expensive to buy. I make my own pesto, but I make mine with kale and I managed to develop a recipe that is nut free and pine nut free. Why not try my salmon zoodles with kale pesto and feta, you can’t get much healthier than that. Low-carb heaven in a bowl. Chia seeds also contain vitamin B6, K, copper, calcium, and almost every trace mineral such as iron, magnesium, manganese, selenium and zinc. Chia seeds also have a whopping 18% omega 3. One of the highest plant sources of omega 3 which makes them incredibly popular with vegetarians and vegans. Chia seeds are versatile because they have virtually no flavour, they absorb any liquid, then swell to many times their size. They can be used as a pudding, drinks or breakfast meal. Vegans even use “chia eggs”. Water is added to chia, the chis swells, and the whole “chia egg” can be used in various baking with varied success. Almonds also contain vitamins B2, B3, E, copper, magnesium, manganese, phosphorus and zinc. Almonds are commonly used in low-carb baking as almond meal, almond flour and ground almonds, They are simply variations on ground almonds but differ in the texture and grade. Almond flour is generally finer grade and the almonds have had their skins removed. Almond meal and ground almonds are the same, coarser grade. Some brands remove the skin, others you may see little brown flecks which is the skin that was left on during grinding. Personally I prefer ground almonds/almond meal as it is cheaper and makes for a lovely alternative to breadcrumbs in many savoury recipes. To read the Ultimate Guide to Low-Carb Flours, click here. Sunflower seeds also contain vitamins B1, B2, B3, B6, E, copper, selenium and zinc. Sunflower seeds are often used in granolas, grain free granola bars and are becoming more popular as an alternative low-carb flour for those who cannot tolerate almond flour. If you can’t find sunflower meal (flour) near you, you can make your own by grinding them in a coffee grinder or food processor. I have successfully made Fat Head pizza using sunflower meal when I ran out of almond meal. Pistachios also contain vitamins B1, B6, K, copper, phosphorus and zinc. Pistachios are becoming increasingly expensive, and because they are incredibly high in net carbs, I very rarely buy them. The only reason I might buy them, is to use pistachios for decoration using their lovely purple/green colouring. They look beautiful stirred through a low-carb ice cream, or to garnish a coconut fat bomb. Cashews also contain vitamins B1, B6, K, copper, magnesium, manganese and zinc. Cashews are the nut that most people find hardest to give up at the beginning of living low carb. They are often cooked in oil, salted and accompany a drink. The oil is often found to be a vegetable oil (read here why we avoid those) and the salt/oil combination hits our ‘bliss point’. Cashews are creamy and are often used in “healthy” recipes to replace dairy. Many vegans use cashew milk, cashew cream and even cashew cheese. Cashews are often used for the base of a raw cheesecake (along with medjool dates) so can you just imagine how high in carbs (albeit unprocessed ones) these “healthy” recipes are. So just be aware of what goes into a recipe when eating out, and what a recipe calls for on the internet. All “healthy” recipes are not created equally. Chestnuts also contain vitamins B1, B6, C, folate and copper. I once made the mistake of buying chestnuts and baking them in the oven without doing my research. Well mistake number one was not to read the carb value (some reference quote chestnut up to 56% carbs) and mistake number two was not to read the baking instructions. Let’s just say my entire kitchen was covered in exploding chestnuts. I learnt my lesson and will never ever buy these little suckers again. So which nut or seed was most surprising? Which one will you never buy again? For me, I went to town when I first went low carb, thinking it was OK to snack on nuts again. And it is, but to a point. I snack on them occasionally, I don’t buy roasted or oiled nuts and I put a few in my hand then put the packet back in my pantry. Nuts and seeds are lovely to snack on, full of trace elements and minerals, but it is helpful to know how many carbs are in each to make an informed choice. Chia seeds have 10g carbs and 10g fiber. That’s is net carbs of 0 per serving. I assume at 100 grams with is over 4 servings this would not be more than 2 net carbs. Oh my goodness, all these infographics are great! I am printing them all out for easy reference. Thank you so much for doing all the legwork for us!! My pleasure 🙂 I’m so glad they are helping you spend your carbs wisely. On the roasted green pumpkin kernels package I get here in Thailand, it says 2 grams of carbohydrates and 2 grams of fiber per 25 gram package, which comes out to 0 net carbs. Why is there such a huge discrepancy compared to the values mentioned in the article above? Your nutrition label is stating net carbs and the fibre separately. Some countries nutrition labels differentiate, others don’t. This article will help you with food labels and nutrition panels. Pumpkin seeds macros are reported as 100g = 14g net carbs. Where did you get 5g? Nikram, can you tell me where you got your carb data from for pumkins seeds? As I mentioned in another comment, the net carbs on the green pumpkin kernels I get here is 0 . . . according to the manufacturer. The fact that they are pumpkin seed kernels must be the reason for the discrepancy. Anyone have any thoughts on this? Apart from considering carb values, just wondering if we should be concerned about eating too much polyunsaturated fat from eating nuts/seeds? I haven’t been able to find any clear info about how much omega 3/6 we should be getting? Would love any advice! This is an area where more research is emerging all the time. I have started to limit how much I use almond flour/almond meal for this very reason. Read this post where I discuss almond flour vs coconut flour. Thanks, Libby. I have read that post and feel the same way about flour choices. In David Gillespie’s books he warns about eating nuts and seeds liberally but i haven’t heard many of the other nutrition gurus say too much on the topic. If you find any more emerging research I would LOVE to see it on blog. I always feel like I’m in limbo land when shopping wondering whether to put nuts and seeds in my trolley or not! For a good explanation of fats, see ch. 8 in Jeff Volek’s The Art and Science of Low Carbohydrate Performance. Omega imbalance is definitely an issue to consider; chiefly, being high in Omega 6’s. A health guru of mine says peanut butter should have a skull & cross bones on it because it’s so high in Omega 6. You can google info about the omega balance or ratios of nuts & seeds or which ones are specifically high in Omega 6. It’s fascinating stuff! I don’t like to give quantities as everyone will be different but I like to vary everything I pop in my lunch boxes, so nothing is more dominant than another. For me, it’s all about variety. So a little pot might be good, see how much comes home uneaten and be guided by that. Do any of these numbers take into account soaking and sprouting the nuts/seeds. That reduces the carb count but the amount varies. Great article, but what about flax seeds? Great suggestion. Flaxseeds contain per 100g total carbs 29g, fibre 27g net carbs 2g. They are a great source of fibre, magnesium, calcium and vitamin B6. They are sued as a bulking agent in many grain-free granola recipes, breads and smoothies.